As a fishery-independent survey, our task is to monitor the population of fish – mostly those of commercial value – at a wide variety of locations. While commercial operations provide some information based on their annual catch, a fishery-independent survey is able to conduct a broader assessment in a given area of the ocean, even though fewer fish are caught. Because there is no limitation on fish size and a wider array of locations are sampled, these surveys can be used in conjunction with reports from commercial fishing vessels to provide a better picture of changing fish populations over time. I am on the second leg of the sampling survey in the Southeast Atlantic, and I am working the 6:00 AM – 6:00 PM shift. 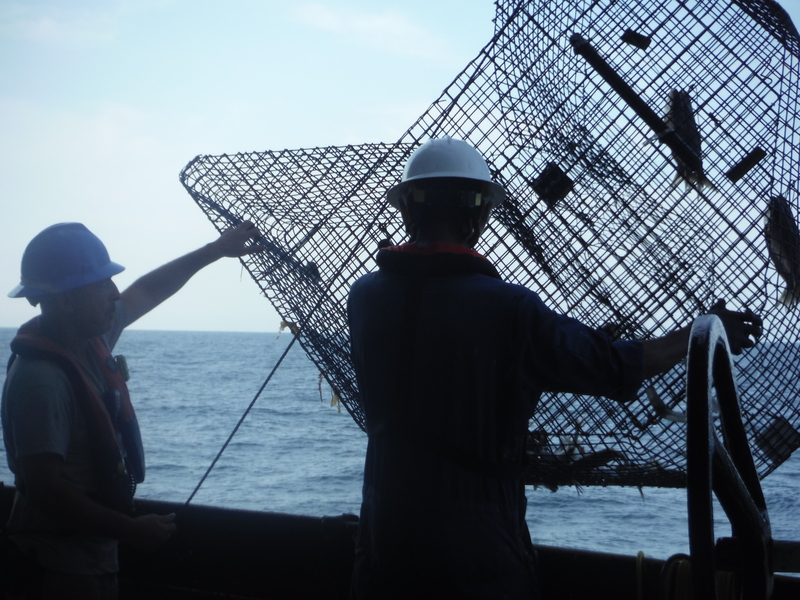 We will be setting traps and cameras in waters between Myrtle Beach, SC and Hatteras, NC. NOAA Ship Pisces left port at 2:00 PM on Tuesday, July 22. I stood near the bow of the ship as we headed out to sea, and watched flying fish zip through the spray. Once we left the sheltered waters near Morehead City Port, the seas became rough. High winds led to high swells, and we were unable to set any fish traps that afternoon. Because of these conditions, we changed our plans so that we could shelter behind a cape overnight. Flexibility is key! Today, skies were clear and the water was calm. We deployed a total of 18 traps in three areas over the course of the day. I helped to bait the chevron traps and line them up on the deck. Once the ship was over the chosen location, the traps and buoys were pushed overboard. Most of the traps today were deployed at a depth of ~25 meters. Six traps are deployed in an area, and are set at least 200 meters apart. The traps soak for 90 minutes, and then the ship circles back for the first trap. It is hauled up on the starboard (right) side, and the fish fall into a large tray placed beneath the trap opening. The crew pulls up a trap. We collected a variety of fish which had to be sorted, measured, and either kept for further sampling or returned to the sea based on the species. 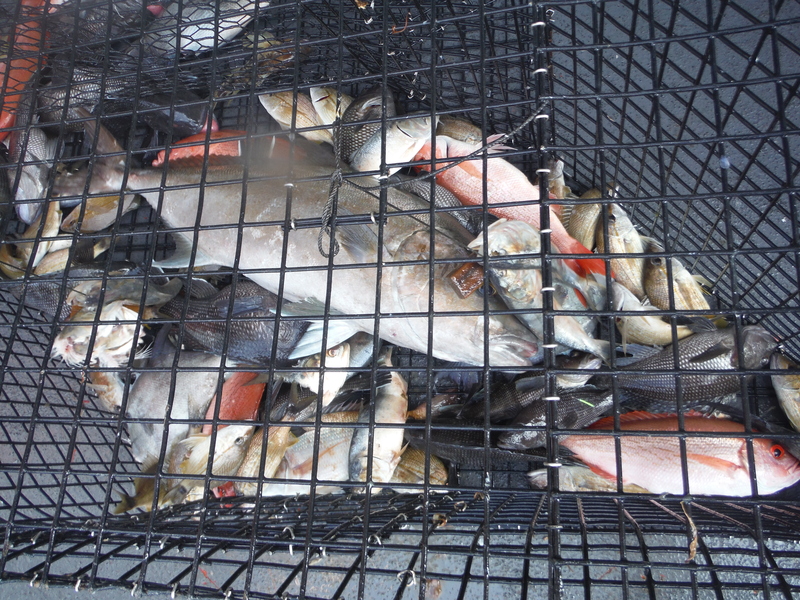 The bulk of the fish were black sea bass, but there was also a wide range of small fish (including scup, pinfish, and tomtate), red snapper, gag grouper, toadfish, and triggerfish. A small octopus came up with the second trap, which was exciting for the whole crew! One trap line snagged during retrieval, so a couple people may try to collect it on a future dive. The camera footage has been interesting too, as there are many fish that may swim near the trap but never enter. Therefore, the cameras provide additional data for the survey. Just today, a tiger shark was caught on tape! A wide variety of fish are brought up in a chevron trap. I have only spent one full day at sea so far, but I am enjoying every second of it. I am fascinated by all of the fish and other marine life. I spent some quality time watching dolphins jumping alongside the ship in the afternoon, and just looking out over the water. Sometimes the horizon is completely empty. Occasionally, I can see a lighthouse on a cape or another ship. Most of the time, we are surrounded by only sea and sky. The color of the water varies with weather conditions and water depth. I have not experienced any sea sickness, and I am grateful for that. It was a little difficult getting used to the movement of the ship. I was definitely wobbling all over the place on day one. The swells were big though, so everyone was wobbling around with me. Putting food on my plate during dinner was especially challenging – and keeping it on my plate while walking to a table was more challenging still! However, my sea legs are improving, and I managed to do some yoga at sunset on the fly deck with a couple of the crew members! I didn’t fall over…. much. It was great way to wrap up the day. Keeping up with regular activities, like exercise, is really important while at sea. I am also growing used to the sensation of being rocked to sleep at night. The triggerfish earned its name because of its dorsal fin. If you press down on the first spine (a long, thin bone) at the front of the fin, it won’t budge. However, if you place your finger on a lower, shorter spine (the “trigger”), you can collapse the fin. Cool! I love this gray triggerfish! 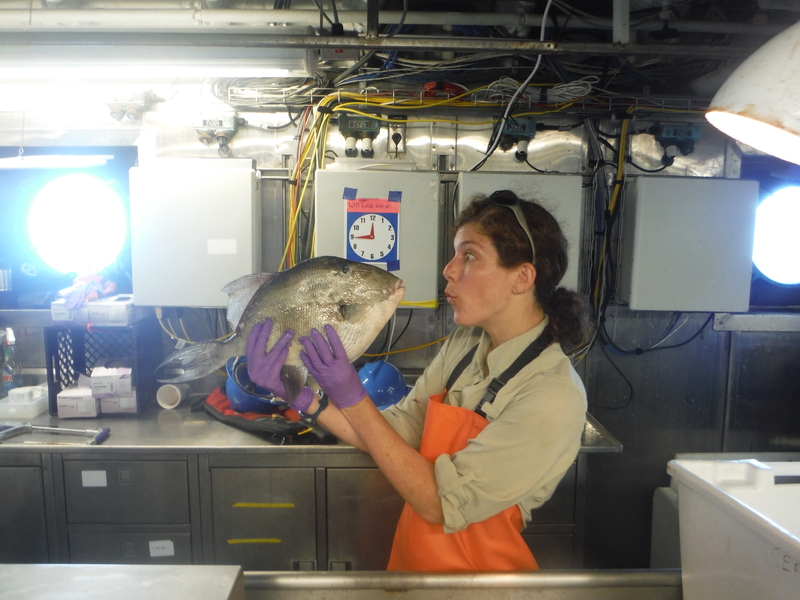 This entry was posted in 2015, Leah Johnson, NOAA Fisheries Service, NOAA Teacher at Sea and tagged Atlantic Ocean, fisheries, Pisces, SEFIS. Bookmark the permalink.